There is one job I haven't had to do in the garden for 48 days now - read the rain gauge. As I enviously watch the blobs of blue move across the weather charts in the far north and west, tongue lolling, I'm sure almost all of you and your gardens will be feeling the effects of this desiccating summer. Just look at my lawn, if you can now call it that. I know it takes considerable nerve to hold off from trying to revive it with the hosepipe, but water is so precious that we must. After all, grass is tough - the yellowing is what nature designed it to do. 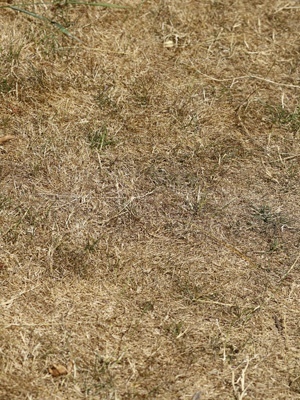 Grass goes into dormancy, pulls down the precious moisture into its roots, and waits for the rain. If you want proof that your yellow lawn is very much alive, have a gentle tug at a tuft - if it pulls straight up, the grass is dead. But if it doesn't, it's not - it's dormant. But peer in among the swaying stems and look, there's green! It shows how sheltered the ground is down there, the effects of the sun moderated, protected by its own canopy of grass stems. 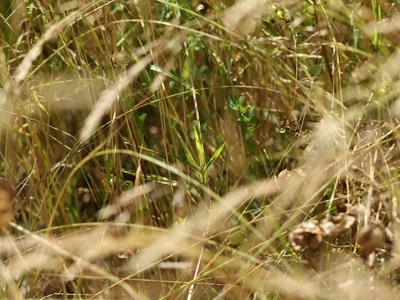 No wonder letting grass grow long in places is so good for wildlife. 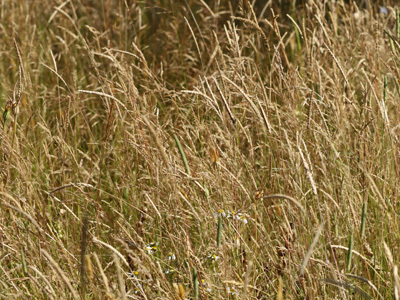 If you haven't done so this year, do consider giving the mower a rest next spring. 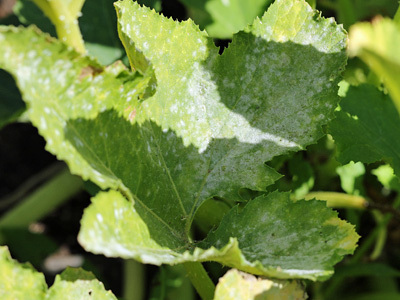 Elsewhere around the garden, plants such as my courgettes are struggling with mildew, that dry white fungus that forms like powder across leaves. I once thought 'mildew' must be something to do with 'dew', but it is actually a sign that the plant is water-stressed and needs more water. And take a deep breath and hold off from watering plants that will survive perfectly well without, such as lawns. 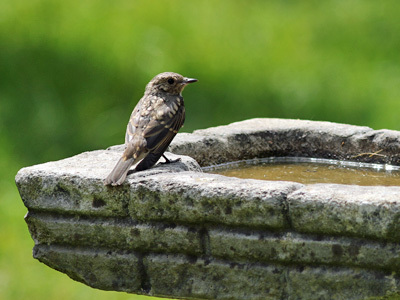 Of course, the other thing in such hot, dry conditions is to ensure that birds have access to water, and right now bird baths around the country will be keeping millions of birds sated. A daily queue of visitors may form, and you may get unusual visitors all desperate for a sip - last year I was treated to a juvenile Spotted Flycatcher at my bird bird. All you need to do is change the water regularly to keep these hotspots (or should that be 'wetspots') hygienic, and then enjoy the splashy show! I have cleaned out a smal seed tray sunk it in the flower border near shrubs and filled it with water. Been inundated with birds using it for drinking and bathing!